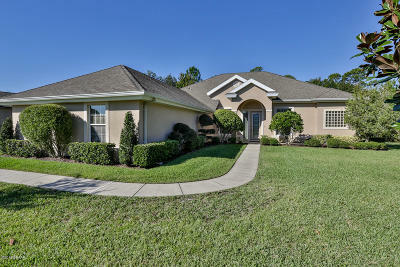 983 Stone Lake Drive Ormond Beach, FL. | MLS# 1050629 | Realty Evolution, Inc. specializing in listing & selling residential homes, condos, townhouses, residential lots and land in Ormond Beach, Palm Coast, Flagler Beach, Plantation Bay, Halifax Plantation, Hammock Dunes, Daytona Beach, Port Orange, Florida. This well maintained home has a Great Room floor plan with 4 bedrooms, 3 full baths, den, with screen enclosed pool overlooking conservation area for privacy. Home features a formal dining room with tray ceiling, den w/ French doors, wood floor, and a built in office unit. Great Room features gas fireplace, crown molding, and triple sliders to pool area. The kitchen has newer stainless appliances, wood cabinets, under counter lighting, granite counters w/seating for three or four, pantry, and a nook for casual dining. This home has a split bedroom plan which allows privacy for you and your guests. The Master Bath includes dual vanities, water closet, garden tub, shower, and linen closet. Many upgrades: newer AC, tile floors, plantation shutters, ceiling fans. 3 car side entry garage. While membership is optional, Plantation Bay features 45 holes of championship golf, two club houses with restaurants, fitness center with spa, 10 lighted Har-Tru tennis courts, pickle ball, cabana, and room to enjoy the park like setting. Club has a variety of membership programs available.